If you wonder how the US could be supporting Turkey that is waging a veritable war on its civil Kurdish population, maybe you should take a look at the way people are being treated in America first. Back in the mid-twentieth century, the city of Flint, Michigan was a bustling industrial town. Home to General Motors car manufacturing plants, Flintonians enjoyed union wages with an average annual income higher than San Franciscans or Chicagoans. When the General Motors plants began to close in the 1980s, a blue collar work force was left without the blue collar jobs. Unemployment soared. The plant jobs had attracted a largely black population and Flint, once a boom town, became a bust town. In 2011 a state of financial emergency was declared by Governor Rick Snyder. 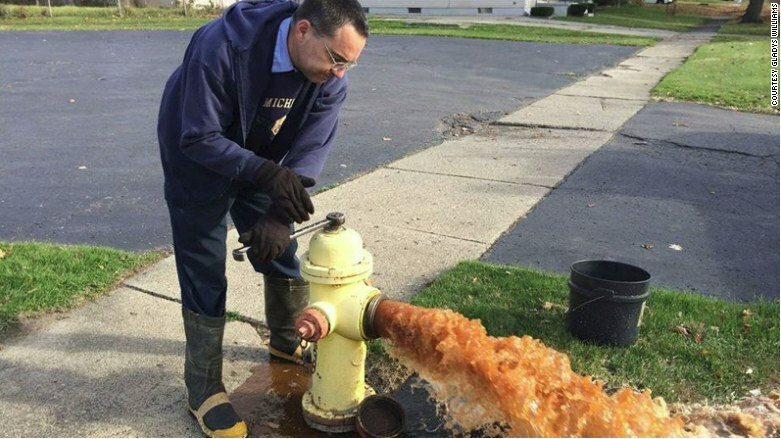 Out of 80,000 industrial jobs, Flint was reportedly left with only 8,000. It is due to Dr. Attisha’s persistence that the story of the children of Flint being poisoned with lead, an irreversible neurotoxin, was finally brought to light. One of the disturbing aspects of the Flint situation is how many people at how many levels of government knew about the problem and did not act. Officials at local, state and federal level are implicated in knowing about the leaded water problem and failing to act. As this story gains impetus, reports are coming in from other areas of the country indicating a similar problem with lead in the water. The Chicago Tribune recently ran a story revealing that the aging infrastructure in Chicago is also producing lead poisoned water. “More than two years after federal researchers found high levels of lead in homes where water mains had been replaced or new meters installed, city officials still do little to caution Chicagoans about potential health risks posed by work that Mayor Rahm Emanuel is speeding up across the city,” reported the Tribune. It was reported in January that the Navajo water supply had been poisoned by leakage from uranium mines. The article attributes the Pennsylvania and New Jersey levels to consumption of lead paint chips in older houses. However, Hillary’s efforts did not achieve the desired result. It was shortly reported that, as US Senator from New York, Clinton had voted against a bill which would have banned a fuel additive which was contaminating water supplies across the country. MTBE was used to make fuel burn cleaner but was found to be a carcinogen. In 2000, a federal investigation found that wells in at least thirty- one states were at risk for MTBE contamination. The legislation to ban MTBE was passed by Congress in 2005. Clinton voted against the ban. Apparently, Clinton’s campaign promises to Flint fell on jaundiced ears. In the recent primary election in Michigan, Clinton was walloped by presidential hopeful Bernie Sanders. The Republican Presidential candidates have all condemned the failure of government to address the Flint water crisis but have failed to suggest any remedy or assistance. The indifference or complicity of various levels of government to the poisoning of Flint, Michigan has historical equivalents. The Tuskegee experiments, in which African American males were put into an experimental study group, without their consent, to track how untreated syphilis affected their health, is a well- known stain on US health policy history. More recently, a number of prestigious universities were caught using “premies”—babies born prematurely– in experimental studies which ran the risk of causing blindness or death to the infants. The families were not informed of the risks of the studies. Another unplumbed depth of degradation lies in the buried history of A-South, a psychiatric inpatient unit at the posh UCLA medical center in West Los Angeles, California. A-South was a detached unit which was razed to the ground about ten years ago. It is known that human experimentation was ongoing at A-South, which at least for some period of time only serviced welfare patients. Officials with the hospital continue to deny that A-South ever existed. It has recently been reported that patients housed on A-South were receiving drugs known to be deleterious to their well- being as well as electroshock therapy in excess of what are considered therapeutic levels. It is also known that A-South patients were refused the right to refuse harmful treatment. At least one physician, Dr. Derek Ott, who served as a resident on A-South in the 1990s, has been cited as causing the death of one of his patients. Ott was reportedly reprimanded by the medical board and did not face loss of his license to practice medicine. UCLA has refused to release names of other physicians who did their residency on A-South. The trajectory of what happened to the daughters of Melissa Diegel reveals that courts are involved in terminating the parental rights of parents in order to feed medically challenged children into experimental drug programs. Kayla and Hannah Diegel, both of whom have a rare mitochondrial disease, were taken from their mother after she questioned treatment her children were receiving at Phoenix Children’s Hospital. The two Diegel daughters have apparently been enrolled in drug test trials with Translational Genomics Research Institute. Diegel’s story illuminates the primacy of scientific experimentation over human and civil and family rights. After the Church hearings in the 1970’s, MKULTRA, which was the US’s experimental program dealing with mind control, was reportedly disbanded. Nicholas West reports in Activistpost that the search for mind control technologies has only accelerated. Lesson 5: What else is in the water? Lead poisoning lasts a life time. Once lead enters the neurosystem, it does not exit. Children exposed to lead face a life sentence of diminished learning capacity, lowered IQ and behavior problems. Lead contamination is not the only challenge facing US water systems. As of 2006, sixty-nine percent of Americans were serviced by water systems that employ fluoride. Fluoride affects the hippocampus in the brain, inducing docility and passivity in those who ingest it, and was used to dose and daze the denizens of Eastern European concentration camps, during Hitler’s reign of terror. Another item of concern is the use of chloramines to disinfect water. Chloramine is produced when chlorine is added to ammonia. According to Dr. Winn Parker, chloramine is known to cause breast cancer and miscarriages, and can cause further deleterious effects when imbibed by someone who faces health challenges, such as kidney problems. Recent reports have also raised the bar of alarm on the leakage of pharmaceuticals, such as estrogens, antibiotics and psychiatric medications, into US water supplies. Reports from both the WHO and Harvard University have minimized this as a risk to health. However, articles in medical journals—some going back thirty years—have discussed the problem of antibiotic resistant bacteria in drinking water and the potential effects on public health. Water is life. As the residents of Flint learned, something as precious as water and human lives can now be subject to politicization, scientific experimental imperatives and even, God forbid, a potential eugenics impetus.